Background and Aim: Parents' knowledge and attitude have a very important role in the maintenance of young children's oral health. The purpose of this study was to assess the knowledge, attitude, and practices of parents toward their children's oral health. Materials and Methods: A total of 200 parents participated in the study. Data were collected using a self-administered questionnaire addressing various aspects of knowledge and attitude of parents toward oral health. 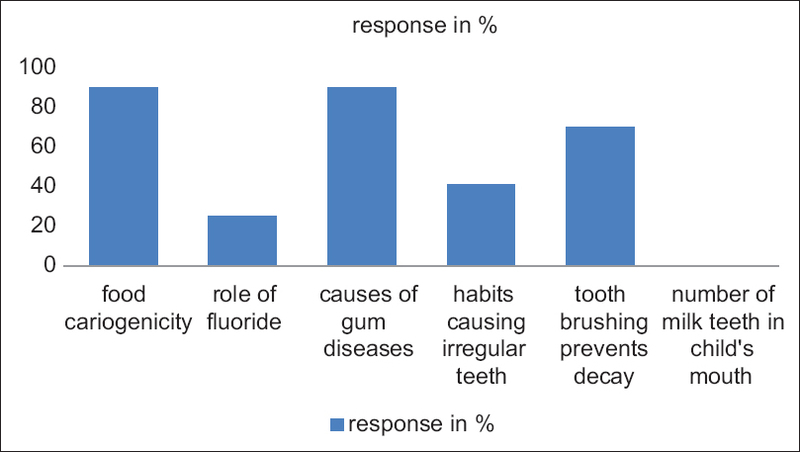 Results: Majority (75%) of the parents had low knowledge regarding the importance of using fluoridated toothpaste. Only 33% of parents were aware that nighttime bottle feeding can cause dental caries. Conclusion: The level of awareness among parents is relatively low, and there is a need to create more awareness about the knowledge and importance of deciduous teeth, regular dental visits among the society, and implementation of oral health awareness programs for parents. Oral health in children plays a very important role as it lays down the foundation for healthy permanent teeth. Parents' knowledge and attitude have a great impact on maintenance of young children's oral health. It is evident that the more positive is the parents' attitudes toward dentistry, the better will be the dental health of their children. Infant oral health care is the foundation on which a lifetime of preventive education and dental care can be built up to help acquire optimal oral health into child and adulthood. These conditions indicate the need for a more in-depth understanding of the health beliefs and practices of caregivers with respect to their children's oral health care. There is a lack of sufficient literature on oral health attitudes of parents toward their children in developing countries like Nepal. Hence, this study was conducted to assess the knowledge, attitude, and practices of parents toward their children's oral health and also to compare the knowledge, attitude, and practices with regard to age, educational level, and socioeconomic status. A cross-sectional study was conducted in the outpatient Department of Pedodontics and Preventive Dentistry, UCMS College of Dental Surgery, Bhairahawa, Nepal, from August 2017 to October 2017, among 200 participants selected by random sampling method. Ethical clearance was obtained from the Institutional Review Board, and informed consent was obtained from the study participants. The participants were administered with a structured questionnaire consisting of two parts. The first part consisted of general information such as the name, age, gender of the parent, parents' education, and occupation. The second part was the questionnaire, which consisted of 22 questions related to knowledge, attitude, and practices toward children's oral health, out of which nine questions were related to knowledge, six were related to attitude, and seven were related to practices. The responses to the attitude questions were rated as follows: (1) agree, (2) uncertain, and (3) disagree. Statistical analysis was done using SPSS version 20 (SPSS Inc., Chicago IL, USA). The P value was considered as statistically significant when <0.05 (confidence interval of 95%). One-way ANOVA was done for the association between the results and educational level of the participants. A total of 200 parents participated in the study. Of 200 parents, 92 were mothers and 108 were fathers. Nearly 75% of the participants were from 30 to 39 age groups. The level of education of the parents ranged from primary education (40%), higher secondary (25%), and university level education (35%). Participants with higher education level had significantly better overall knowledge scores than less educated parents [Table 1]. 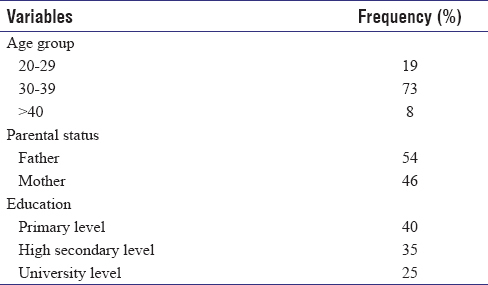 Association between educational qualification and knowledge, attitude and practice scores is shown in [Table 2]. The percentage of parents who answered correctly for individual knowledge questions is shown in [Figure 1]. Nobody was aware of a number of milk teeth in child's mouth. Nearly 41% of parents were aware that deleterious oral habits can cause irregular teeth. When asked about food cariogenicity, 90% of parents knew that sweet food causes tooth decay. Nearly 25% of parents had knowledge regarding the importance of using fluoridated toothpaste. Almost 70% of parents acknowledged the importance of brushing teeth in preventing tooth decay and gum diseases. Figure 1: Percentage of correct answers for knowledge questions. The percentage of participants who correctly answered individual attitude questions is shown in [Figure 2]. Only 33% of parents were aware that nighttime bottle feeding can cause dental caries. About 83% of parents agreed that diet has a role to play in the occurrence of caries. About 75% agreed that it is necessary to take the child for regular dental visits. Only 60% of parents agreed that healthy milk teeth are essential for children to chew the food properly. Figure 2: Percentage of correct answers for attitude questions. About 95% of parents said that they take their child to visit the dentist only during problems. Only 16% of parents visited the dentist 6 months after birth. Only 20% of parents brushed their child's teeth twice a day. Oral health of children depends on the awareness of their parents as oral health knowledge of parents dictates the oral health-related habits of the children which are established during infancy and maintained in early childhood. Dental caries is a preventable disease. If preventive strategies are implemented at an early age, valuable time and money spent on dental treatment can be saved by parents. Hence, oral health education of parents is essential as the preschool age group (2–4 years of age) is dependent on them for their oral healthcare needs, and later on oral health promotion measures such as proper brushing and fluoridated toothpaste can be encouraged in cooperation with the parents. To achieve these goals, one needs to assess the existing levels of knowledge, attitude, and practices so that preventive strategies can be formulated. The most effective form of administering fluoride is through the regular use of fluoride toothpastes. However, the present results suggest that parents seem to have low awareness of fluoride and its effects on children's oral health. Despite the fact that the absence of fluoride intake does not produce caries, fluoride does help inhibit the disease. This was similar to the study done by Moulana et al. and Suresh et al., The number of children brushing their teeth twice daily was low. Only 20% of parents reported that their children brushed twice a day. Adair et al. stated that children are more likely to be caries free if their teeth are brushed twice daily with fluoride toothpaste, with parental involvement and in an environment where sugar is controlled. The role of nighttime bottle/breastfeeding as a cause of tooth decay was not acknowledged by majority of parents. This is in accordance to the results of a previous study by Rwakatema and Ng'ang'a. To prevent deleterious effects of nocturnal breastfeeding, it is recommended that infants should not be put to bed with the baby bottle and that ad libitum breastfeeding at night should be avoided. Untreated carious deciduous teeth leads to various complications such as pain, oral infection, problems with eating and sleeping, alterations in growth and development, and premature loss of teeth. In the present study, the majority of the parents said that milk teeth do not require good care. The reason for poor knowledge and importance of primary teeth among parents might be due to the fact that these are temporary teeth and they will shed. The limitations of this study were that it was carried out in one institution only by random sampling method with a small sample size. There is a low level of awareness in parents regarding knowledge and attitude toward the oral health of children. Parents can play a very important role in promoting good oral habits, and by imbibing good habits themselves can positively influence their children. There is a need to create more awareness about the knowledge and importance of deciduous teeth and regular dental visits among the society. Health-care professionals need to educate expectant and new mothers about oral health care for infants, especially the use of nursing bottle at night and regular dental visits. Kamolmatyakul S, Saiong S. Oral health knowledge, attitude and practices of parents attending Prince of Songkla University Dental Hospital. Int J Health Promot Educ 2007;45:111-3. Alshehri AR, Nasim VS. Infant oral health care knowledge and awareness among parents in Abha city of Aseer region, Saudi Arabia. Saudi J Dent Res 2015;6:98-101. Moulana SA, Yashoda R, Puranik MP, Hiremath SS, Gaikwad R. Knowledge, attitude and practices towards primary dentition among the mothers of 3 5 year old pre school children in Bangalore city. J Indian Assoc Public Health Dent 2012;19:83-92. Nagarajappa R, Kakatkar G, Sharda AJ, Asawa K, Ramesh G, Sandesh N, et al. Infant oral health: Knowledge, attitude and practices of parents in Udaipur, India. Dent Res J (Isfahan) 2013;10:659-65. Adair PM, Pine CM, Burnside G, Nicoll AD, Gillett A, Anwar S, et al. Familial and cultural perceptions and beliefs of oral hygiene and dietary practices among ethnically and socio-economicall diverse groups. Community Dent Health 2004;21:102-11. Wyne AH, Chohan AN, Alrowily FH, Shehri BM. Oral health knowledge, attitude and practices by parents of the children attending KSUCD clinics. Pak Oral Dent J 2004;24:145-8. Rwakatema DS, Ng'ang'a PM. 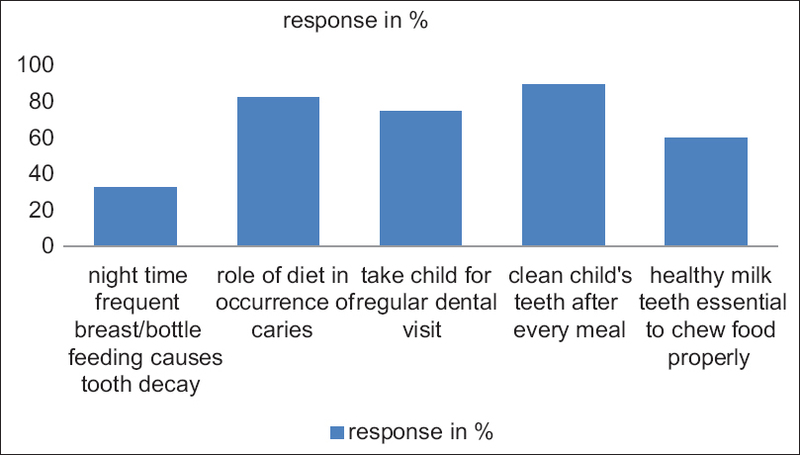 Oral health knowledge, attitudes and practices of parents/guardians of pre-school children in Moshi, Tanzania. East Afr Med J 2009;86:520-5. Schroth RJ, Harrison RL, Moffatt ME. Oral health of indigenous children and the influence of early childhood caries on childhood health and well-being. Pediatr Clin North Am 2009;56:1481-99.